When Lisa Dickenson won the Novelicious Debut of the Year for Twelve Dates of Christmas, it propelled her into Hollywood stardom and she now spends her days hosting dance parties with Beyoncé and meeting up for regular coffee dates with her friends in Central Perk. Well, not quite. But she has written a host of fabulous books since, including You Had Me At Merlot, Catch Me If You Cannes and the brand-spankin' new Mistletoe on 34th Street, which brings Lisa back to her festive writing roots. In Lisa's latest novel we get to meet Olivia who works for the Girls of the World foundation, a UK-based charity championing girls and giving them opportunities (such as classes and guidance) that would otherwise have been out of reach. One of the things Girls of the World has been trying to do is break into the US market and the annual conference in New York this year will be the perfect opportunity to find backing. However, when Olivia's boss breaks her leg during a charity run, it's up to Olivia to head up the New York trip and be in charge of her colleagues; some she gets on with, some not so much. It is no secret that I love Lisa's novels because she has the ability to make me giggle-snort embarrassingly when I'm reading her books in public (there have been ~looks~ from fellow commuters), but while Mistletoe on 34th Street was packed with the funnies again, it also feels different to her previous books – in a good way. There was a lot more was going on within the pages and the story went into plenty of unexpected directions, which kept me completely hooked throughout. And while the main character was Olivia (and to a lesser extend the men in her life), there was quite a heavy focus on the individual stories of her colleagues, her family members back in the UK, and even Jon's colleague Carl, who while being a side character to a side story was really rather memorable. Coming all together, it created a rich story and one that I would love to see being turned into a future Christmas film (one can only dream). One main character I haven't yet mentioned but truly takes centre stage within the novel is, of course, New York. And not any kind of New York, no New York at Christmastime! It may not have been entirely Olivia's cup of hot chocolate, but I adore myself the season of merriness and even though I read the book at the end of October, I went all out Christmas-crazy by listening to my favourite festive tunes while reading the book (and now I can't stop!). The jolliness practically leaps off the pages and visiting iconic festive locations in New York has even made me desperate to now visit this city again (preferably at the time of year where I can ice skate in Central Park and see the tree at Rockefeller Centre, which sounded magical in the novel). Lisa's descriptions of the city are enchanting and it's impossible to not feel all Chrismassy, and fall in love with the The Big Apple, while reading this book. 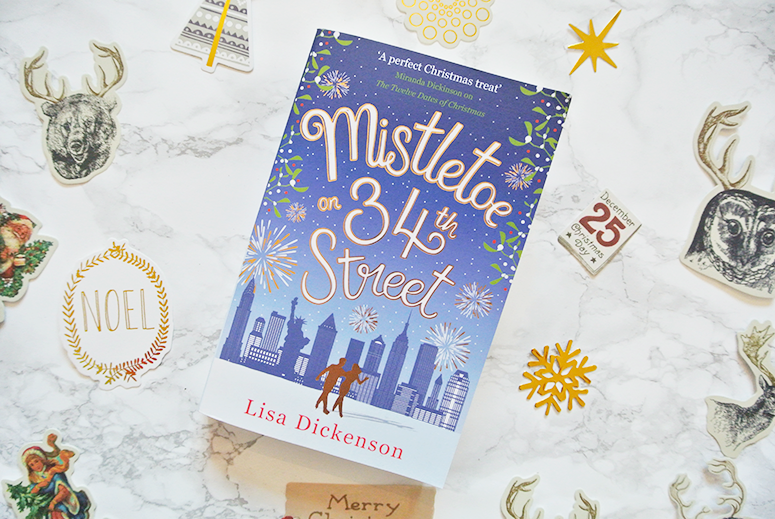 Mistletoe on 34th Street is the festive read you need to get your mittens on this Christmas! It is funny, romantic and packed with a heartwarming story that will melt even the iciest of Grinch hearts. Plus, I've heard from a reliable source* that each copy comes with a mistletoe snog from Lisa, so what are your waiting for?! *Lisa may or may not have been joking when she said this on Twitter. Mistletoe on 34th Street is published by Little, Brown Book Group and you can get your copy from Foyles or your own preferred retailer.